Reeder, Chiu. Ocean acidification and its impact on ocean noise level: An analysis using empirical and physical models of acoustic transmission loss. Presented at ASA October 2009 meeting. Udovydchenkov, Duda. Ocean noise level change in response to ocean acidification. Presented at ASA October 2009. These two papers take a closer look at the widely-noted ocean noise implications of increasing ocean acidification (a combination of factors related to global warming is triggering a steady increase in the ocean’s pH, which decreases sound absorption). When the acidification results were first released there was much speculation that shipping noise would propagate farther, resulting in cumulative ambient noise increases throughout the oceans. These two papers, presented at this fall’s Acoustical Society of America meeting, both come to the same conclusion: low frequency noise will not be significantly increased due to ocean acidification; rather, the primary changes will occur at mid-frequencies. This calms concerns about shipping noise, but may (over time) lead to slightly larger areas being impacted by mid-frequency active sonar, some acoustic harassment devices used by fish farms, noise from recreational boating, and other mid-frequency noise. The take-away from three new research papers appears to be that while significant proportions of the population – often around 25% – are affected by moderate wind farm noise, neither increasing wind farm noise nor even annoyance with noise lead inevitably to health effects. There is an entire separate body of research investigating various attitudinal aspects related to stress and health, which only muddy the waters as we try to interpret these direct studies on wind farm noise. Some studies indicate that attitudes toward a noise source can affect both annoyance and stress responses, and that a subjective sense of being threatened can likewise increase physiological responses to noise; however, once again, these correlations are far from universal, so they cannot be used to “explain away” either annoyance or health impacts that do take place, any more than annoyance can be used as a clear indication of eventual health effects. A five-week beaked whale Behavioral Response Study in the Mediterranean concluded in early September with a mixed bag of results: while researchers were unable to affix D-tags to any beaked or pilot whales, they were quite successful in using a new mobile Passive Acoustic Monitoring system which could be very useful in years to come. 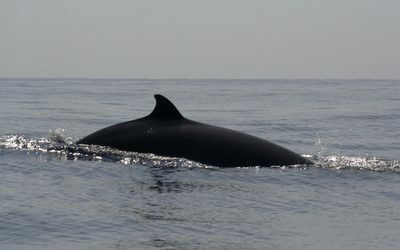 The study was largely aiming to track whales’ responses to various (low to moderate) levels of mid-frequency active sonar sounds using D-tags on the animals; previous Behavioral Response Studies using such “controlled exposures” have taken place on Navy instrumented ranges where the local populations are presumably familiar with sonar sounds, so they may respond differently than whales who have not heard these sounds before. However, due to many periods of rough seas, as well as the inherent difficulties of finding, getting close to, and attaching tags to beaked whales (who dive for over an hour and come to the surface only briefly), no D-tags were deployed on whales, and no controlled exposures took place. However, a document prepared before the cruise, summarizing previous BRS results, is well worth reading: see especially page 8, which includes a detailed analysis of beaked whale responses to sonar and orca sounds: in both cases, the whales cut short foraging dives, but returned to the surface more slowly than normal, not more steeply as is sometimes assumed, and they clearly moved directly away from the sounds. The debate over wind farm siting is becoming exceedingly tangled, with visual, noise, and health impacts all on the table, and too often blurred by both proponents decrying NIMBYism and opponents with varying degrees of clarity about their fears and concerns. Prescott makes a potentially valid point when he suggests that in this age of climate crisis, resistance to visual impacts should give way to the greater public good, as it has with cell phone towers and power lines. Yet the noise impacts are real, and increasingly well-documented within a half mile to a mile—see this fascinating summary of the disconnect between 1.5-2km (a mile-plus) setback guidelines suggested by researchers and health officials responding to noise issues and the much closer setbacks (1000 feet to 550m/1800 feet) actually being implemented by local, state or provincial, and national standards. When concerns about health effects extend beyond just sleep disruption from audible noise, to include effects of inaudible, but still physiologically significant, low frequency noise, things get more nebulous and difficult to either quantify or protect against, since susceptibility to LF noise is more variable from person to person, and LF noise levels are much harder to predict in the landscape. AEI will soon be focusing more intently on the slew of reports and studies that have come out in recent months, with a goal of organizing the mass of information into something useful for planners, citizens, and those in industry who want to work with residents more constructively. UK environmental groups have raised concerns about the move of a Europe’s biannual Naval exercise to waters outside Moray Firth, which is home to Scotland’s only bottlenose dolphin population, and an area in which an increasing number of marine species has been seen in recent years. Operation Joint Warrier will involve 20 ships, 4 subs, and 40 aircraft, and lasts from October 13-22. Sarah Dolman, The Whale and Dolphin Conservation Society’s noise campaign manager, said that a full environmental assessment should have taken place before any such operations near a Special Conservation Area, continuing that ‘the Ministry of Defence should ensure compliance with legislation before it moves its exercise into this important, and protected habitat.” A spokesman for the MOD says that active sonar will not be used within the Firth, and is limited areas more than 30 miles from the Conservation Area, assuring that noise will be within tolerable levels within the Firth’s important habitats. After a stranding event last summer which was never conclusively tied to sonar, but appeared related to similarly distant military exercises, the area will be closely watched by all this month, I’m sure. For more detail, see articles in The Telegraph and BBC. A northern bottlenose whale that wandered deep into Loch Eli recently is one of ten that have either stranded or seen in lochs in recent years. Researchers wonder whether noises at sea may be “herding” normally deep-water whales into the narrow lochs, where they become disoriented and perhaps also trapped by other noises. In the recent case, whale was only persuaded to leave when a nearby fish farm had turned off its seal-scaring device. Volunteers from the Marine Life Rescue Unit then used underwater loudspeakers to play sounds of their own – including a recording of a hunting killer whale — to push the 10-metre whale back out to sea. In recent days, one such whale died after being helped toward sea, and one survived. “The whales are migrating at this time of year, so we normally do see more of them, but to have so many washing up is a little strange. There’s an enormous amount of man-made noise out at sea off the northwest of Scotland, and we can’t rule out that this is what causing them to come ashore,” said Mark Simmonds, Director of Science for the Whale and Dolphin Conservation Society. The 184-page report offers a comprehensive overview of research into the various effects of noise on sleep quality and health (including the health effects of non-waking sleep arousal), and is recommended reading for anyone working with noise issues. The use of an outdoor noise standard is in part designed to acknowledge that people do like to leave windows open when sleeping, though the year-long average may be difficult to obtain (it would require longer-term sound monitoring than is usually budgeted for by either industry or neighborhood groups). The carefully-watched population of beluga whales in Alaska’s heavily-used Cook Inlet continued to shrink in the most recent counts, despite efforts to minimize the disruption of a major construction project underway at the Port of Anchorage. This report from a local TV station gives a good quick overview, and this article in the Alaska Journal of Commerce has a bit more detail. A NMFS survey counted 321 belugas this year, down from 375 last year, when the Cook Inlet beluga population was officially listed as threatened; a habitat protection plan is in process. The survey (as with previous ones) has a substantial margin of error; numbers could be anywhere between 226 and 456, according to a good overview in a local paper. Construction at the Port of Alaska, which began several years ago and is slated to continue until 2014, is halted when belugas are seen nearby (the distance at which construction is halted is not specified in recent articles; belugas are, however, highly sensitive to sound, often avoiding sound sources at greater distances than many other species). “This wasn’t in my budget,” said Port Director Paul Sheffield of the whale watchers, laughing, “but yeah, we spent about a million dollars a year and we hire about 22 people.” The National Marine Fisheries Service has determined that the whales would not experience long-term adverse affects from the noise, but some people fear it may be driving them away. Lois Epstein is an engineer who runs the Alaska Tranporation Priorities Project, a group which promotes safe, economic, environmentally appropriate projects. “Of course it’s good that during construction they are trying to minimize the effect on the Cook Inlet belugas but that’s not going to save the whale during the long run, that’s only during the construction phase,” Epstein said. According to a detailed article on the current expansion project by Courthouse News Service, The port expansion project was originally planned in 1999 as a relatively modest renovation project, expected to cost $229 million. But that all changed after Sheffield was hired as port director in 2001. “They just kind of scrapped the whole deal and decided they would mow over the whole port,” Richard Burg told the Anchorage Daily News. The newspaper said Burg lost his job as port engineer in 2002 in a dispute over the huge project, because he did not see the need for it. In what may be a legal breakthrough for soundscape protections, a Federal Judge has issued a preliminary injunction forbidding drilling on a National Wildlife Refuge adjacent to the Great Sand Dunes National Park in Colorado while a challenge from environmentalists moves forward; the groundbreaking bit is that he apparently has followed the National Park Service’s lead in considering the natural soundscape as a resource deserving of protection. Thanks to the National Parks Traveller blog for the heads-up – head over there and read all about it!